On Sunday May 6, 2018 at 11amET, the Ontario Police Memorial Foundation Ceremony of Remembrance will be broadcasted in HD quality on Youtube Live and on Twitter Live on the @HeroesInLife twitter account. The link on Youtube to watch is embedded below. Please share the the link for this page to watch with interested people CeremonyofRemembrance.ca/Live The broadcast will archive on the same links and be available to watch anytime later. 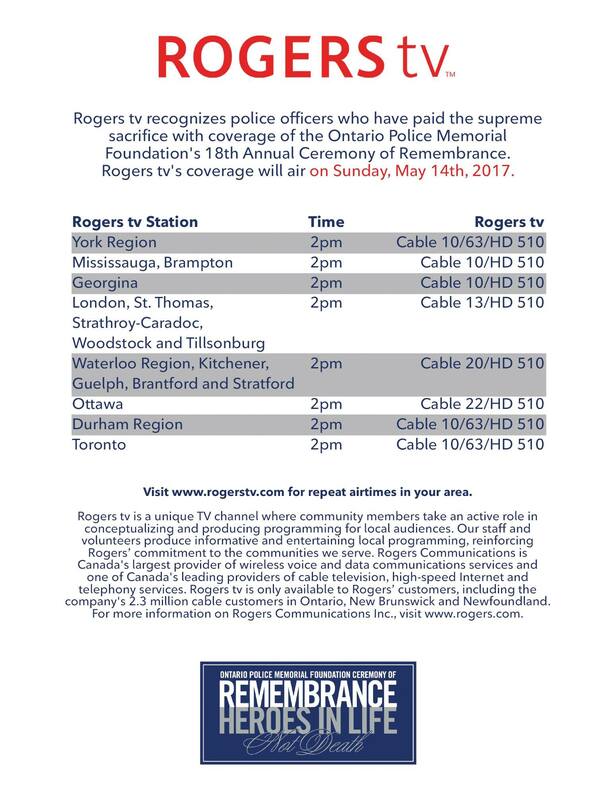 In case you were unable to attend the 2017 Ontario Police Memorial Foundation’s Ceremony of Remembrance honouring those who have fallen in the line of duty, Rogers TV will be broadcasting it on Sunday, May 14th, 2017.